Since the last issue of Wood Matters, climate issues have had considerable coverage in the mainstream media. The USA and China announced during the G20 Summit in Brisbane that they had agreed emission targets. These two countries are the world's largest emitters; together they accounted for 45% of all emissions in 2012. Previously the reluctance of these countries to participate in climate change negotiations and binding targets has had the effect of other countries holding back in formulating their commitment to reducing greenhouse gas emissions. It does, however, seem a long-shot that Obama will be able to action his intentions with a Republican congress whose core supporters come from the industries that have the most to lose from the implementation of any climate change policy. At home this month, Brian Fallow of the NZ Herald wrote an opinion piece that is critical of New Zealand's rising emission profile and lack of convincing intention under the current ETS policy. See Brian Fallow: NZ ducking the climate question. ERUs can be used for surrender purposes for pre-1990 forest land deforestation completed in 2014 or the preceding four years (with surrender due by May 2015). If you intend to surrender ERUs by May 2015, the deforestation notification must be submitted by the 31 December 2014. At current prices, using ERUs for surrender of a deforestation liability equates to a cost of approximately $90 to $180 per hectare depending on forest location and the age of harvest of the trees. Using todays NZU prices this deforestation liability would equate to a per hectare cost of $2,400 to $4,800 if using NZUs for surrender. NZUs will be the only unit allowable for surrender after May 2015. Using ERUs while they are still available for use is the least cost option for meeting the deforestation surrender liability. If you have completed harvesting of pre-1990 forest land in the last four years and are not replanting, please contact erin.leahy@pfolsen.com to discuss your obligations under the ETS. NZUs rallied this month to trade in the range of $4.30 to $5.60 per NZU. There are still very few sellers in the market and the market has been buoyed by emitters with interest in seeing at what price levels sellers of NZUs will enter the market. ERUs have traded in the range of $0.14 to 0.18 per ERU. 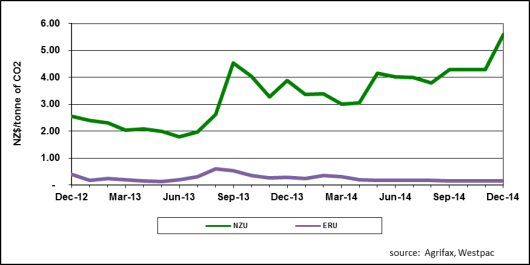 The figure below shows the recent carbon credit prices, for both NZUs and ERUs.